Cage is a two player game, played on a 10x10 checkboard with 50 red and 50 blue checkers. The board is initially set up as shown in Figure 1. 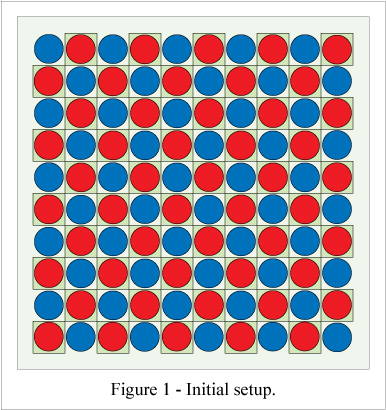 The two players, Red and Blue, take turns moving their own checkers, starting with Red. If a player has a move available, he must make one. If a player has no moves available, he must sit the game out until he does have a move available. At least one of the two players will always have a move available. Draws cannot occur in Cage. Mark Steere designed Cage in May 2010. 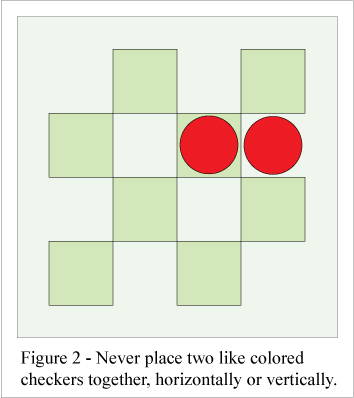 Never place a checker orthogonally (horizontally or vertically) adjacent to a like colored checker. Not even momentarily during a multi-move turn. 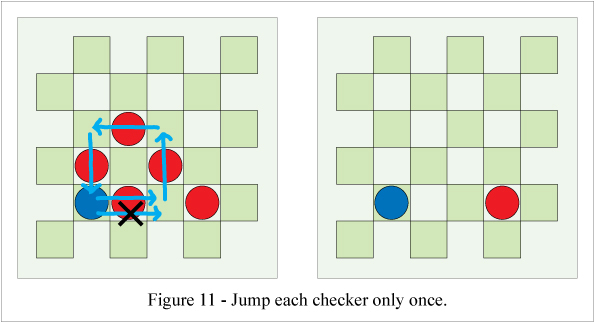 Never move a checker that has orthogonal adjacencies with enemy checkers to a square where it doesn't, unless the move is a jump (see the Jump section below). 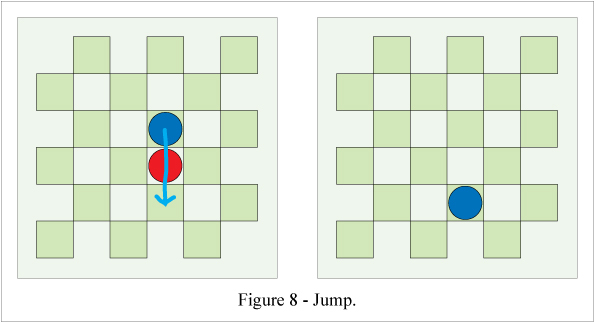 In Figure 3, Blue's only legal move is a jump. 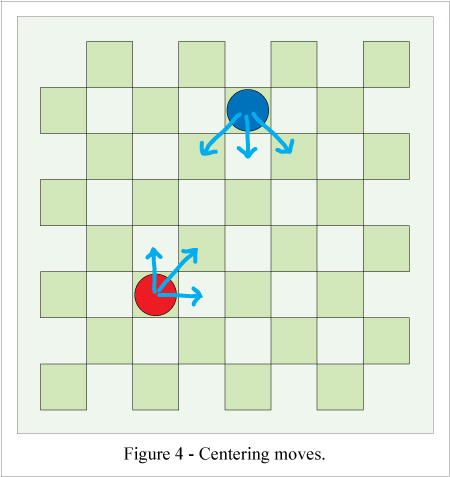 The centering move is a single-square move to an adjacent (horizontally, vertically, or diagonally), unoccupied square, which brings a checker closer to the center of the board. NOTE: A centering move reduces the straight line distance from a checker to the center point of the board. 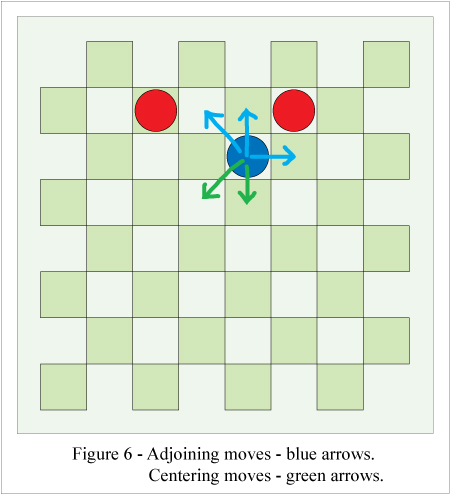 In Figure 4, Red only has three moves available and Blue only has three moves available. In Figure 5, the squares marked with an X represent illegal moves since they violate restriction #2 described above. Only one centering move can be made per turn, and it must be the only move of any kind in the turn. 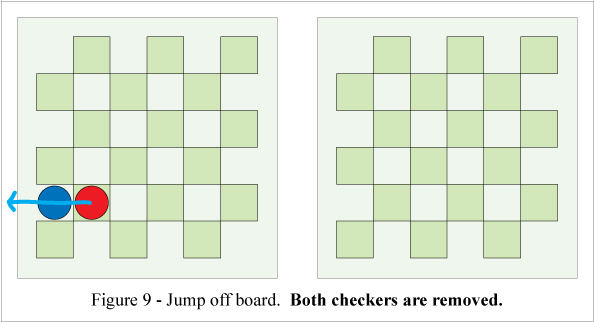 A checker which has no orthogonal adjacencies with enemy checkers can be moved a single square in any direction to a square which does have orthogonal adjacencies with one or more enemy checkers. 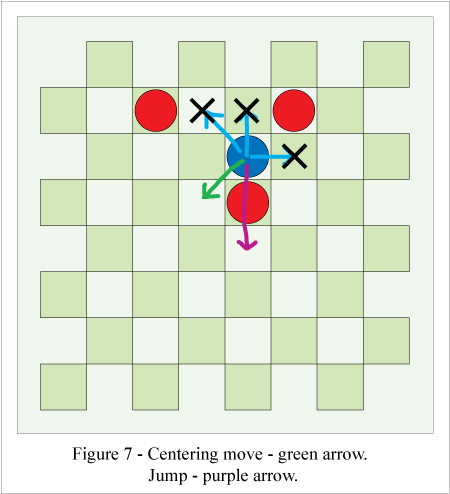 In Figure 6, Blue has three adjoining moves available (blue arrows) and two centering moves available (green arrows). 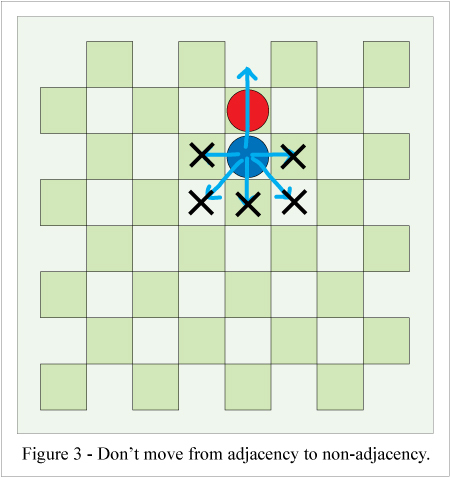 In Figure 7, the squares marked with an X don't qualify as adjoining moves because the blue checker is already adjacent to a red checker. Blue's only legal moves are a centering move and a jump. Only one adjoining move can be made per turn, and it must be the only move of any kind in the turn. You can capture an enemy checker by moving a friendly checker from an orthogonally adjacent square on one side of the enemy checker to the adjacent square on the opposite side of the enemy checker (if the latter square is unoccupied). In Figure 8, Blue captures the red checker and wins the game. You can capture an enemy checker on the edge of the board from an adjacent square on the opposite side of the enemy checker from the board edge (or one of the two adjacent board edges in the case of a corner square). Both the capturing and captured checkers are removed from the board in an edge capture. 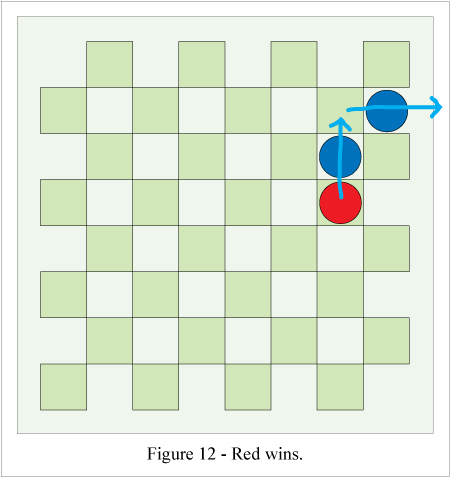 In Figure 9, Red captures the blue checker, removing both checkers from the board, and wins the game. Capturing is not mandatory, as it is in Checkers. That is, you aren't required to initiate your turn with a jump, unless that's the only type of move you have available. Once you've made a jump though, you can't make any other type of move during your turn. And you may be required to make additional jumps while it's still your turn. If it's possible to use the jumping checker to jump again, you must do so while it's still your turn. And so on. Your turn concludes when said jumping checker lands on a square from which no jumps are possible. 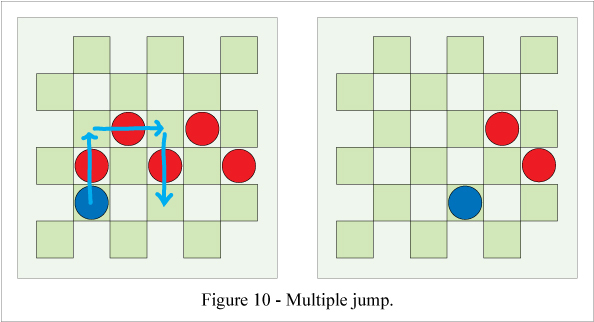 As Figure 10 demonstrates, there's no requirement to select the path of maximum capture in a jump sequence. Never jump the same checker more than once. 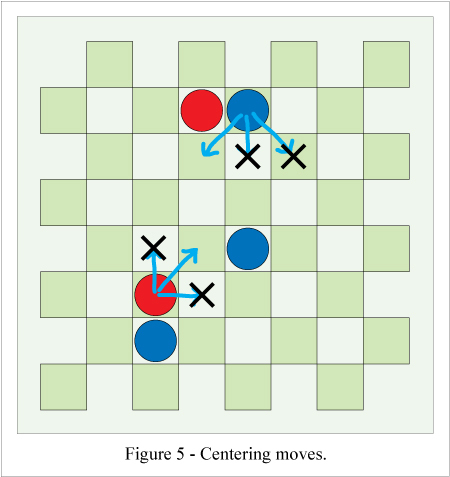 In Figure 11, Blue can't capture all of the red checkers. To win, you must capture all enemy checkers. If you remove your own last remaining checker while capturing all remaining enemy checkers, you still win. Feel free to publish this rule sheet, and to program the game of Cage for online or offline play. No licensing fee or royalties are expected. However please don’t change the name or the rules, and please attribute the game to me, Mark Steere. My other games can be found at Mark Steere Games.